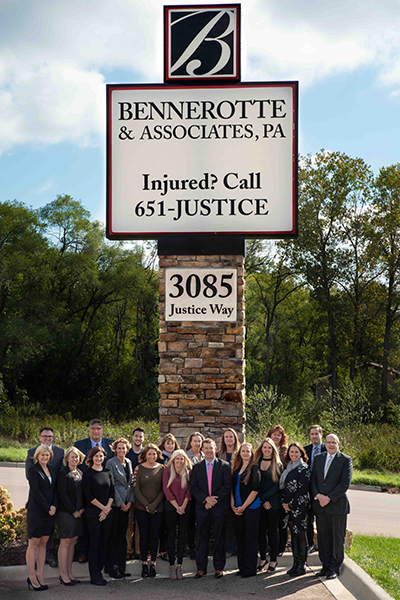 At Bennerotte & Associates, P.A., your attorney takes responsibility for the outcome of your personal injury claim. You receive personalized and straightforward legal counsel from the beginning of your initial consultation through to the resolution of your case. Our attorneys hold each other accountable, and we empower our clients to stand up for the injury compensation they are entitled to. Based in Eagan, MN, our attorneys and professional support staff have local roots. We serve people in the Minneapolis-St. Paul metro, in Rochester and throughout Minnesota. We understand the stress, pain and turmoil you are experiencing. You need straightforward answers, around-the-clock service and trustworthy advocates. We apply our capabilities, resources and passion comprehensively on behalf of our clients. You don't get positive results without passion. An aggressive lawyer, and even a lawyer who claims to have expertise, can fight for your compensation until the end of time. However, no lawyer will provide your case value or achieve the results you deserve without taking the time to understand your personal situation, the opposition you face and the critical aspects of your case. Our attorneys are different. We dedicate ourselves to each client's best possible outcome. We investigate and fully prepare cases ourselves. We are informative, responsive and resilient. Discover more about each of our talented and knowledgeable attorneys by following the links below. CONTACT BENNEROTTE & ASSOCIATES, P.A. We cater to your needs and back up our integrity with results. If you are considering a personal injury claim or have been contacted by an insurance company offering you a settlement, contact us as soon as possible at 651-JUSTICE (651-587-8423). Click here to see our staff biographies.